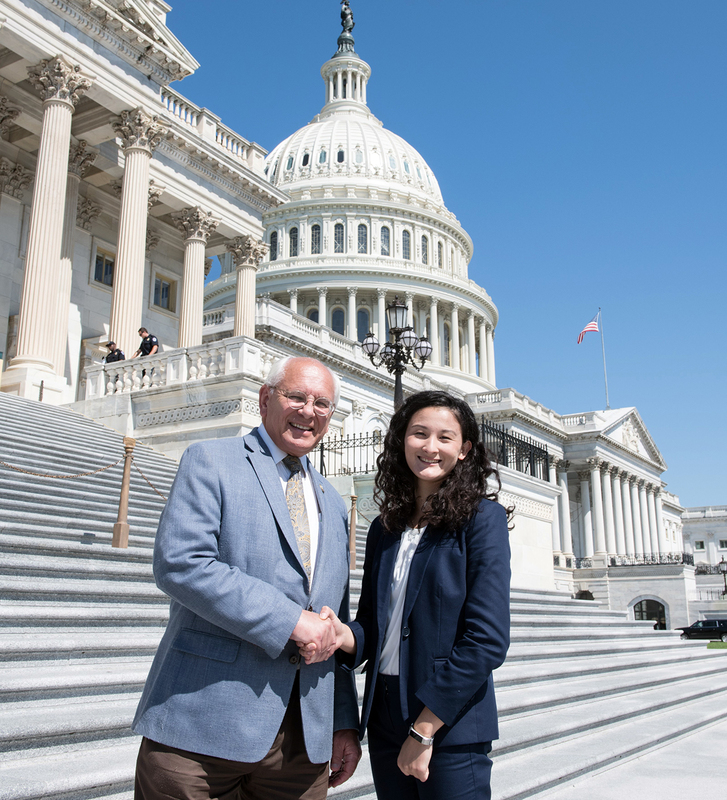 Sara Conroy interned with Congressman Paul Tonko in Washington, D.C., last summer. When Clark University student Sara Conroy ’20 was looking at colleges, she started with the book “Colleges That Change Lives.” As she toured isolated, rural campuses, she realized what was missing: a city. She recalled her tour at Clark, one of the urban colleges featured in the still-popular college guide. Since then, the Traina Scholar has taken advantage of Clark’s urban setting, and found multiple opportunities to get involved on and off campus. A soccer player, Conroy has made the NEWMAC Academic All-Conference Team, and she’s the sports editor for the student newspaper, The Scarlet. Her sophomore year, she worked on a data analytics project for Clark’s Mosakowski Institute for Public Enterprise, in cooperation with the Boston Federal Reserve Bank. She helped create a user-friendly tool that compares the demographic, geographic, and economic factors within mid-sized cities across Massachusetts. In addition, she assisted the Mosakowski Institute in presenting Massachusetts’ annual Family Impact Seminar at the State House in Boston. In Worcester, she volunteered at the Division of Public Health, producing a report about student health resources in the city’s public schools. Those experiences, in turn, helped her land an internship in Washington, D.C., last summer with her congressman, U.S. Rep. Paul Tonko, D-N.Y. A political science major and history minor, with a concentration in law and society, Conroy received funding from the Political Science Department’s Harrington Public Affairs Fellowship Program. 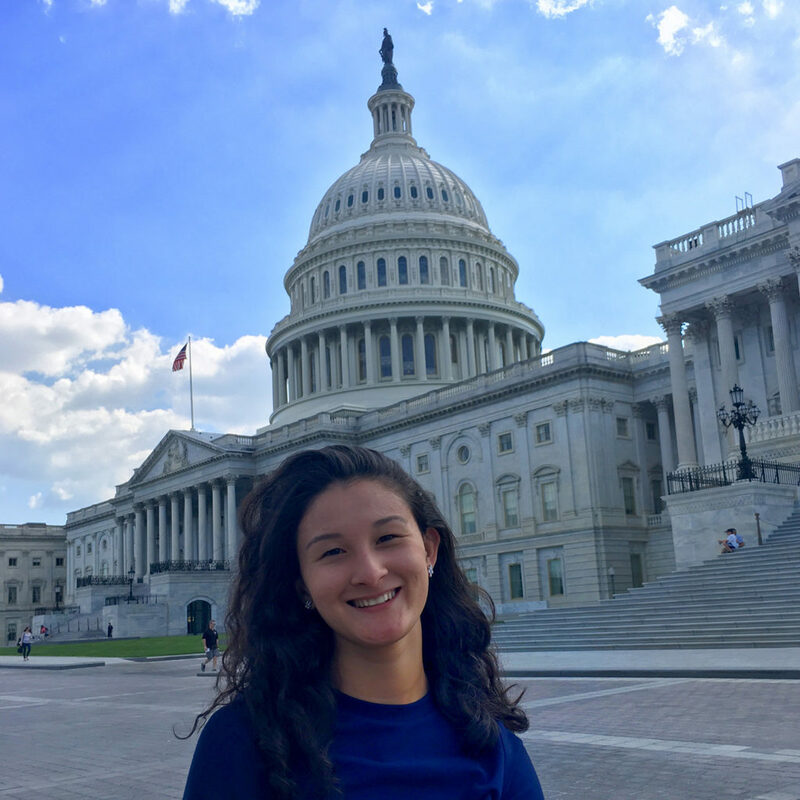 Next spring, she will study European government and politics at the CAPA Global Cities program in London, a program recommended by one of her faculty mentors, Professor Heather Silber Mohamed. Below, we asked Conroy — who plans to enroll in the University’s Fifth-Year Accelerated B.A./ Master’s Program in public administration — about her experience at Clark so far. I have benefited greatly from Clark’s size and its dedication to providing practical experience. During my second semester at Clark, I met with Professor James Gomes [former director of the Mosakowski Institute for Public Enterprise] to get some advice on my path, and he suggested that I join him on a trip to the Boston State House to learn more about public policy and find out if it was truly my passion. It was the most enriching experience I had yet. Professor Gomes went on to offer me a position at the Mosakowski Institute, and became an influential mentor for me. My parents work in the education and health departments in Albany, N.Y. Through discussions at home, they exposed me to public service. This sparked my initial interest in public service, and as I entered college, I found that there was a deeper passion. I have a vested interest in the American public and the role our governments play in our everyday lives, and the history behind the modern American experience with public policy. What do you like best about studying your major? My favorite part about studying at Clark is how students are open to discussion. I have taken numerous political sciences courses, and in every single class, there was active participation. We spend a lot of time discussing different interpretations of the material, rather than being lectured. I have made a lot of friends in my department though open class discussions. “Clark professors, faculty, and students push me to be the best student and individual I can be,” Sara Conroy says. I recently took a class on urban cities. For our final project, we were asked to create a proposal that would help an urban city. I came up with what I thought was a decent first proposal, but my professor asked me to completely rework my approach. They told me that my project was what I had envisioned might help a city, but not what an urban community might find useful. I had to look to the community for answers, rather than imposing a plan on the community. This anecdote sums up the moment where I realized what getting a college degree was all about for me. It’s about taking some time to think about how my own knowledge can be enhanced. What do you think makes your major at Clark unique from other colleges or universities? The size of the classes makes Clark’s Political Science Department stand out. Professors and classmates really know who I am. This creates a welcoming and cohesive environment and also builds self-confidence. My meaningful relationships with my professors have given me the confidence to pursue a career in politics and have higher aspirations. Which faculty members have mentored you? Other than Professor James Gomes, I look up to Professor Heather Silber Mohamed. Professor Silber Mohamed came to teach after many years on Capitol Hill, and as I look toward orienting myself for a place in American politics post-graduation, she has been incredibly influential. Are there other mentors you have at Clark? Head Coach Brienne Smith of the women’s soccer team was my first adviser at Clark. Soccer was a very large part of my decision to come to Clark. Coach Smith assured me that I could play a collegiate sport and still pursue a rigorous academic schedule. How does your summer internship in Washington fit with your goals? I hope to pursue a career in legislative staﬃng as a legislative assistant or, further down the road, a legislative director. In my internship, I gained experience working each day with legislative assistants, constituents, and administrative staﬀ to learn about the legislative process and how these employees can best serve their congressman. How has your coursework prepared you for experiences outside the classroom? Professors focus the content of their classes around how we can apply what is being taught in the course to what’s going on in the world. They give students a chance to ask contextual questions and analyze the information that is in textbooks and PowerPoint slides to suit modern applications of that information. This has ultimately led to my being able to use every single class I have taken at Clark in external settings. My ability to apply knowledge to a work environment has been incredible helpful. I hope to work as a legislative assistant in either the federal government or New York state government. I hope to research, advise, and create public policy. How has Clark helped prepare you? Clark professors, faculty, and students push me to be the best student and individual I can be. I have learned an incredible set of values from the Clark community, including dedication, compassion, and innovation. With these traits and an education, I am ready to take the necessary steps toward my career goals.